On Sunday we hosted the Harrogate, Knaresborough and Ripon Clandestine Cake Club meeting, unfortunately only one person showed up from the ten who had RSVP’d! 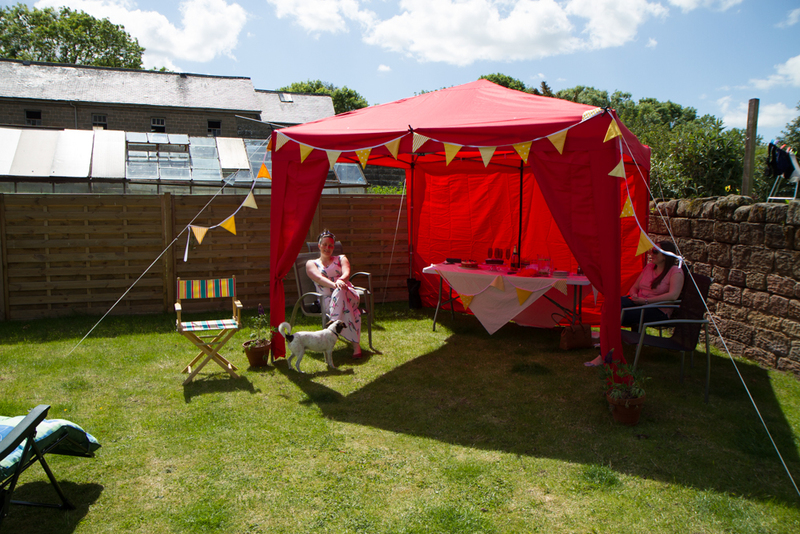 However, we had a lovely afternoon as we were determined not to let the effort we’d gone to go to waste, we’d spent hours on making bunting and Anthony had bought us a rather lovely red gazebo! 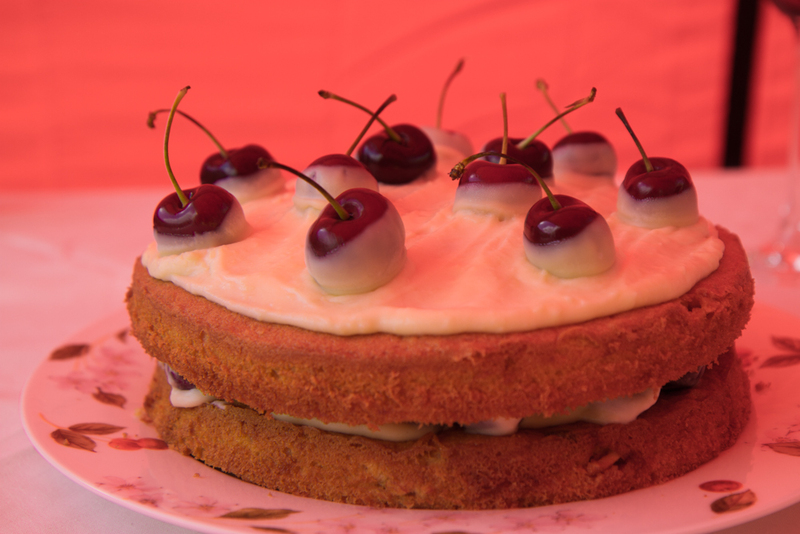 Sam who came along brought a delicious fresh cherry and white chocolate cake, absolutely gorgeous and she’d even managed to find a plate with cherries on to match the cake! I had tried baking a proper cake for the first time with buckwheat flour and I was incredibly pleased with the result so I thought I’d share it. I saw the original recipe a few weeks ago and knew immediately I wanted to make it for the cake club meeting! The almonds in it really work with the flavour of the Elderflower cordial and I think that the nuttiness of the buckwheat flour really compliments it too. I first tried baking with buckwheat flour about five years ago when I was experimenting with cupcake recipes my mum would eat, however this also involved replacing sugar with Agave syrup and coconut! Compared to other gluten free flours I find that it behaves the most like normal flour and creates a really good mix and in turn a really good bake, I hope you enjoy it too! 2. 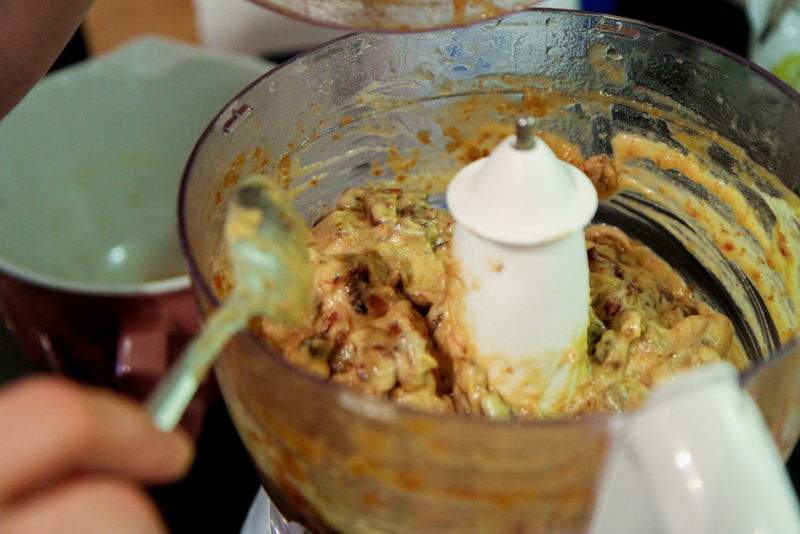 Mix together butter and sugar with electric beater or by hand until very light and fluffy. 3. Beat the eggs with a fork then add slowly continuing to beat until thoroughly mixed in. 4. Fold in the almonds, flour and baking powder followed by the cordial. Mix until combined but be careful not to beat out the air. 5. Pour into your prepared tin and cook for 45-50 mins until springy to the touch and a skewer comes out clean. 6. Mix together the cordial and sugar, poke holes all over the cake and pour over as much as you like so that the drizzle can soak into the cake and then leave to cool. The cake is also delicious still warm! Enjoy! Sunday – Anniversary celebrations! Steak et al! Actually trying lots of new recipes this week which is quite exciting however maybe a bit foolish as I have lots to do other than cooking! We have a very full freezer and I’m trying to be careful with spending so each meal is based largely around things we already have in. We got the steak we’re having on Sunday for about 10% of the price at M&S a couple of weeks ago, so it feels like even more of a treat! I baked a proper yet gluten free cake at the weekend (recipe to follow) and it was really good so I’m really excited about the prospect of more experimentation in the coming weeks! I love baking, so when I saw that Sunday 17th May was #WorldBakingDay I couldn’t resist finding something to make that would fit with my current gluten free, chocolate free, dairy free diet! 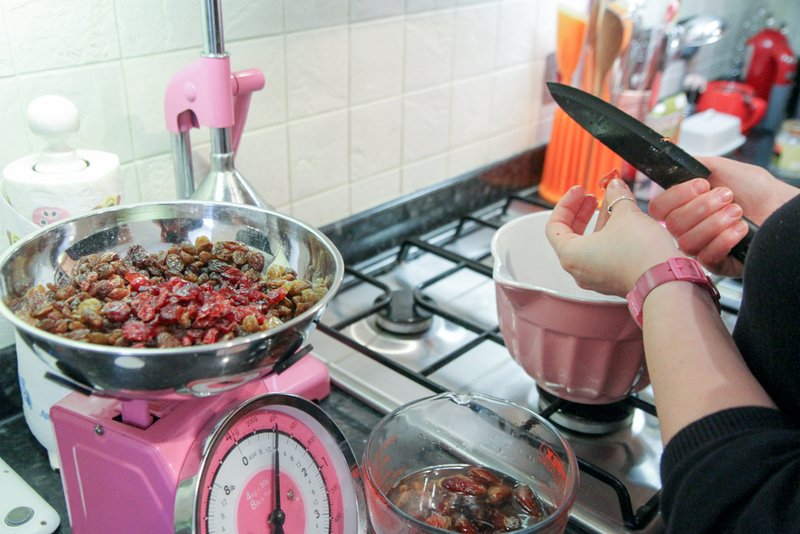 Thankfully I have a recipe that’s been tried and tested – The Everythingless Fruit Cake! 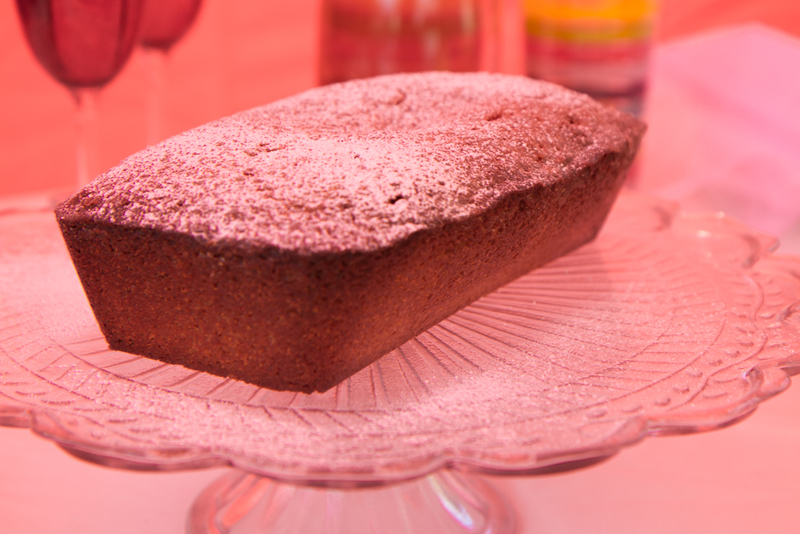 This is a recipe my Mum introduced me to when she first went gluten free and its basically like a gluten free version of malt loaf. I’ve just sat down with my first slice to write this and I’d forgotten just how good it is before I bit into it, the dates go like toffee and the orange flavour – just wow! So here’s the recipe, I hope you enjoy it as much as I do! – Soak the dates in the warm water and once you have grated the rind from the orange, juice the two oranges and place the dried fruit in a bowl with juice and the rind. – Preheat the oven to 160 degrees C or gas mark 4. – Pour into a greased (and if necessary lined) loaf tin and place in the preheated oven for 1 hour 15mins. The mixture will still be slightly gooey because of the dates but the cake should hold together. I have to confess that my favourite way to eat this cake is warmed with butter (I’ve not given that up as it doesn’t seem to bother me and I don’t like the alternatives) but its great warm or cold and another relatively guilt free sweet treat!